Between 1992 and 2010, the childhood cancer mortality rate decreased by an average 2% per year. The incidence rate increased by 0.4% annually on average. 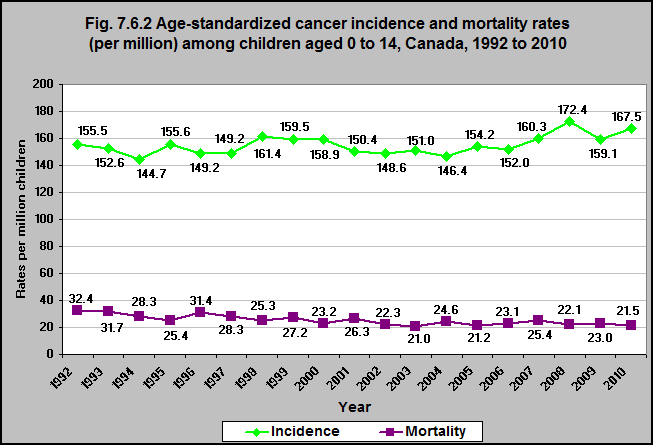 1Lawrence Ellison L and Janz T. Childhood cancer incidence and mortality in Canada. Health at a Glance. Statistics Canada Catalogue no. 82-624-X. September 22, 2015. http://www.statcan.gc.ca/pub/82-624-x/2015001/article/14213-eng.htm#a8– accessed June 22, 2017.